Beautiful, attractive, lively and trendy, Bordeaux is at the same time authentic and high-tech, a city turned towards the future which nevertheless preserved the richness of its past and its traditions, which is worth this first place. Castle Bussaguet was part of the property of Raymond Eyquem, uncle of the famous humanist Michel de Montaigne. 10 ha with woods and river surrounding the current property. Out of town chateau, what's not to like?! The apartment was on the ground floor, it had 2 bedrooms, bathroom and lounge/diner. Our entrance (the side entrance) opened onto an area bordered by a stream, established trees and a road (out of sight). We spent several evenings sitting outside on the table and chairs provided (also loungers and several other chairs and a few tables). We were entertained by an egret visiting the stream, a nightly visit from some deer and even a wild boar on one night. We used the apartment as a base to explore the area to the north of Bordeaux (Medoc/ Haut Medoc) as well as trips to Blaye, Bourg and St Etienne. The coast is 20 minutes away and the beaches are superb. If I could change 2 things...the extractor fan in the bathroom didn't work; the busy road is 100 metres away and we heard traffic on it most evenings. Would I recommend it? Yes, we loved it. History excerpt from the book "Le Taillan Médoc, Yesterday, Today"
This beautiful property is located in the south of the town, on the edge of an arm of the Jalle, called "Jalle de Buceguette" near the place Cantinolle. The name of Bussaguet would be a diminutive of the name of Bussac. Chevalier Guillaume de Bussac owned in 1242 a mill "the molendini of Bussaguet". He had, at the time, different with the monks of the abbey Sainte Croix de Bordeaux, about the dime, of which he was indebted. In the sixteenth century, Bussaguet is the most important Seigniory of the parish of Saint-Hilaire du Taillan and belongs to Raymond Eyquem, sieur de Bussaguet. Uncle of the humanist Michel de Montaigne, he is landowner and Counselor to the Parliament of Bordeaux as all the members of this famous and influential family of the Bordeaux region. The Domaine de Bussaguet stretched over the communes of Taillan to Parempuyre, passing through Eysines, Saint Médard en Jalles, and Blanquefort. Later, the De Cursol family owns it. At that time, around 1780, a large reception house was erected on the plans of the architect Louis: the present Bussaguet. The old castle was partially demolished in 1935. Only the stables and the chapel remain, disused, a stained glass window adorns the church of Saint Hilaire du Taillan. 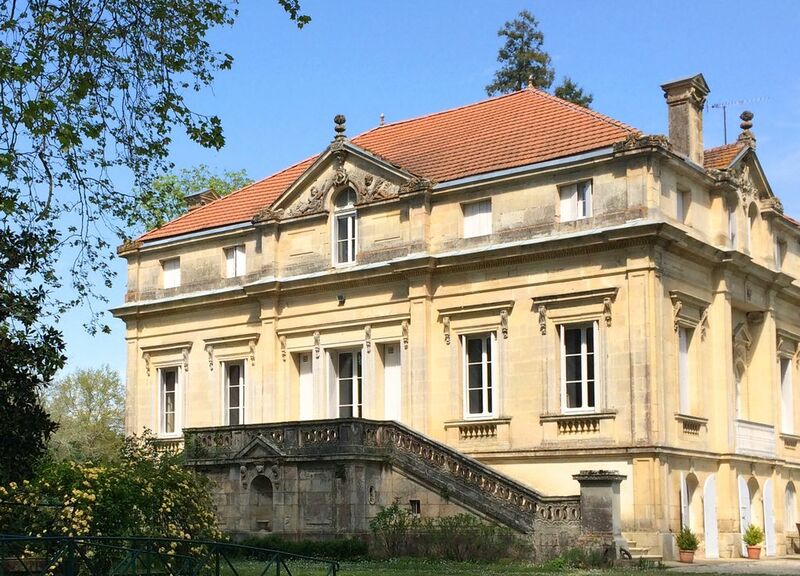 In 1812 the estate belonged to a former Police Commissioner Pierre Pierre who died in Bordeaux in 1822. Without succession, the succession returns to his mother Marie-Thérèse Falgue, widow of Sieur Antoine Pierre. The estate then passes, in 1823, to the hands of Jean-Baptiste Petit Delfau, wine merchant. In 1840, the property produced 80 to 100 tons of red wine and 15 to 20 tons of white wine. His little daughter Catherine Petit Delfau, widow of Joseph Lapène, became owner in 1842. Two mills, Moulinat and Bussaguet, depend on the domain in 1844. Located in the so-called "sources" area, they are bought by the City of Bordeaux during the construction of the aqueduct supplying Bordeaux with drinking water. Ferdinand Lapène, the son of Catherine, was Mayor of the Taillan from 1871 to 1878. Madame Lapène died in 1902. The estate then became the property of Madame Elise Beer of Paris. Maurice Kloz, one of the current owners, bought it back in 1909. ATTENTION ...... CERTAINS G. P.S. DO NOT SITUATE !!!!!!!!!!! At about 3 Kms Shopping Center SUPER U, Station TOTAL on the left. departmentale n ° 1, in the direction of SOULAC, LE VERDON, LE TAILLAN MÉDOC. At 200 meters, PASS 2 BRIDGES on the river "Jalle de Buceguette"
before the indication of the city "LE TAILLAN MÉDOC"